There are 2 entry points into the Notes system. 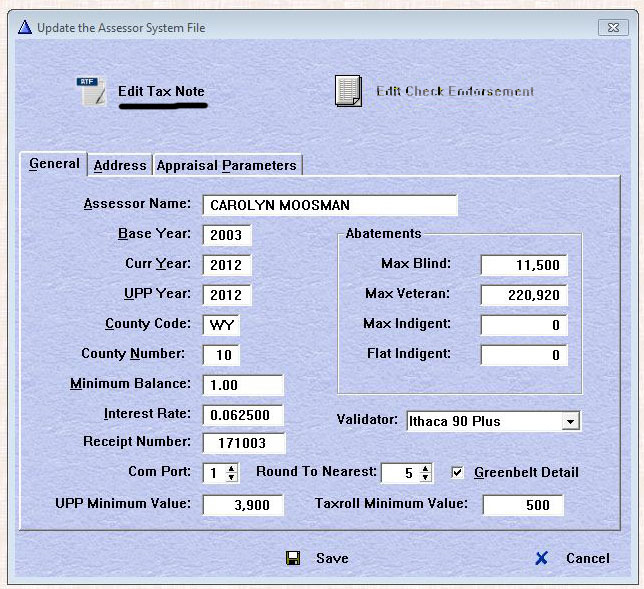 One is through the Assessor System Parameters, System / Assessor Parameters, and then clicking on 'Edit Tax Note' button or by going through the UPP Reports, Assessor / UPP / Reports / Tax Notices, and then clicking on the 'Select Tax Notice Note' button. Either method will take you to the same location. Click on the Insert button at the bottom of the window. You will then see a blank RTF window with the cursor in the Description field. Enter text that describes what the note is and press tab. The cursor will then move to the next window which will allow you to enter the actual note. You may use any of the formatting buttons to change fonts, size, color, bold, italic, etc... The elements that you change is how it will be printed. If you add color to your text and print to a LaserJet that only has black toner, you will get a gray scale representation of that color. After entering the note, click on Save. Click on the Update button at the bottom of the window. The cursor will be positioned in the first character position of the second window. Make any changes that are necessary and then press the Save button. To select a note to print, click on the note you would like to print in the upper window. This will turn the line blue. Then click on the Select button at the bottom of the window. The window will then close after making the note you selected the default note. When the UPP Tax Notices are printed, the selected note will be added to every tax notice.